Making my own clothes (and garments for other people) is really important to me. While my handknitted garments look handmade rather than shop-bought, I still think that making my own clothes brings certain advantages over buying them in the shops. I can choose the yarn or fabric and the little details such as buttons. I can play with the fit by adapting the pattern to cater for my proportions (such as the fact that all my height seems to be in my body) or my preferences for a certain length of sleeve or neckline. I’m still learning how to do this, but there’s no better way than to learn by doing and I’m becoming more confident with each garment that I make. Of course, making a garment is not a particularly fast process, but as long as I’m prepared to accept that I can’t just whip up a quick cardigan to wear at the weekend, it’s satisfying to finish something that has taken time. However, I didn’t always feel like that. In particular, I used to feel that I would never be able to make an adult-sized knitted sweater. I tamed my impatience and increased my skill level when I gave myself no choice in the matter. In 2012, I challenged myself to get through the whole year without buying any clothing, shoes or accessories. The only things I could acquire were those I made myself. I was curious to see how difficult I would find this, and whether it would change my perspective on the clothes I wear and buy. I was also a relatively new knitter with only a few scarves and baby knits under my belt. I had no idea whether I’d have the skills or confidence to embark on a larger project, but I hoped that by the end of the year I would have improved my skills. I will admit that I did stock up on certain things beforehand (as the idea of making my own tights or underwear in an emergency didn’t really appeal!) However, other than those items and one pair of winter boots I didn’t buy anything extra in advance. I managed to stick to my resolution and didn’t buy a single item clothing, shoes or accessories in 2012. I was proud to have stuck to my challenge, but also found that I enjoyed the way it made me look at my existing clothes in a different light. I combined things in different ways that I hadn’t worn before and I learned to feel happy about wearing the same dress to all the weddings I was going to (rather than feeling under pressure to wear something different to each one). These are Picot Socks, which is a lovely free pattern by Lydia Gluck from the Pom Pom magazine site. However, I must take all credit for the lumpiness of these, which is not part of the pattern. My first cardigan was also one of Lydia’s designs for Pom Pom, the Netherton cardigan. The cushion the Picot Socks are sitting on is made by Becca Cadbury, who sells cushions at her Etsy shop made from gorgeous Japanese kimono fabric that she sources. Having a year when I didn’t buy clothes, shoes or accessories kick-started a huge change in my attitude. It really made me think about how easy it is for me to buy clothes without thinking. Where I live, clothes are cheap and plentiful, and I’m lucky that I have a bit of spare cash to buy clothes. It’s easy to acquire new things. I found that I owned too many items of clothing that I didn’t absolutely love, and these tended to be things I’d bought without thinking much about them. I also found that I generally had no idea about whether the person who made my garment had been paid a fair price for their work in decent surroundings or about the provenance of the materials used in the garment. I’m much more considered in my purchases now (so that I tend to buy less, but only buy things I really love). I’m also much keener to make things for myself where that is a practical alternative. During my year of no buying, I invested in a decent sewing machine and I’m trying to build up my skills in knitting and sewing. 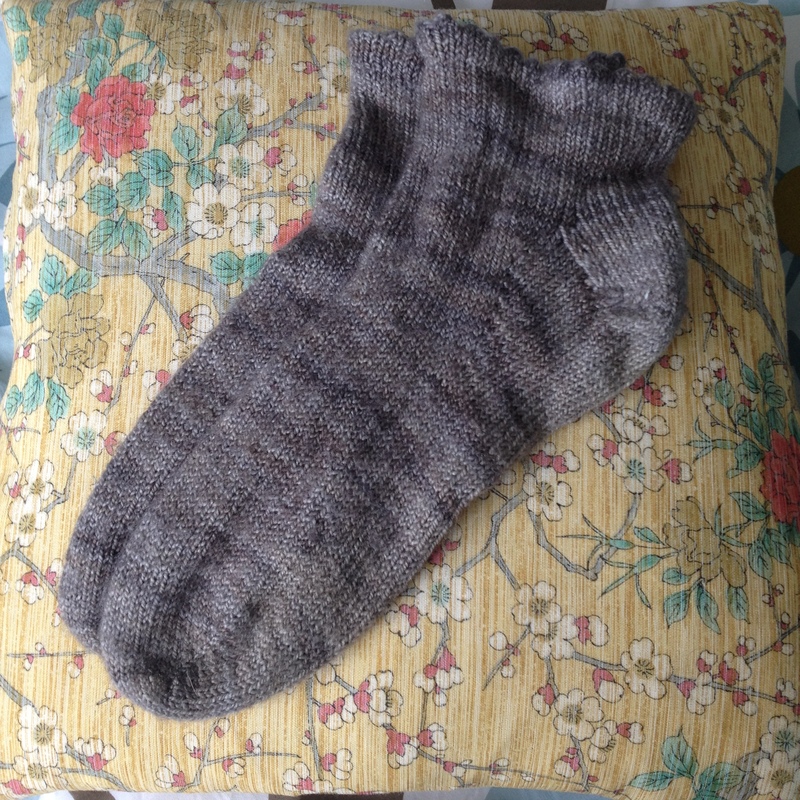 Apart from very plain fine-gauge knitwear for work (which would take me months or even years to hand-knit), I have knitted all my new knitwear since 2012, and I’m trying to replace my shop-bought socks with hand-knitted ones as they wear out. I know that this approach isn’t for everyone. Making your own clothes isn’t always cheaper than buying them, it takes a lot of planning and it’s not fast, but I’m enjoying it, and I love being able to say “I made that” about something I’m wearing. I’m really glad that I gave myself the challenge of a year of not buying clothes, and I think it has changed my views for good. Aside | This entry was posted in Uncategorized and tagged handmade, knitting, Making your own clothes, not buying clothes, Pom Pom magazine. Bookmark the permalink.